Top image: Nicholas Schultz as Herr Drosselmeier and Katherine Minor as Marie Stahlbaum. Above, from top: Fabio Lo Giudice as the Nutcracker Prince, before he wins his fight against the Mouse King. Katherine Minor and Fabio Lo Giuduce. The waltz of the flowers. Almost to the day eight years ago, we reviewed the Royal New Zealand Ballet’s The Nutcracker, a reimagined version set in a 1930s children’s hospital ward. The company has performed The Nutcracker before, with the first in 1963, with a very traditional outing. Tonight’s première, kicking off a season that runs till December 15, takes a traditional route as well, and even for those of us impressed by the inventiveness of the 2010 production, it did not disappoint. Choreographed by Val Caniparoli, designed by Michael Auer, and with the New Zealand Symphony Orchestra (conducted by Hamish McKeich) performing the Tchaikovsky score in the Wellington shows, there was plenty to admire. Jon Buswell’s lighting and the opening set, appearing behind a scrim, were the first noticeable elements: the scenes of Herr Drosselmeier’s workshop and Marie’s bedroom faded in and out theatrically among an animation of houses, before opening to the Stahlbaum home’s grand set and their Christmas Eve party. There was more than enough to get you into a Christmas mood already, more than a Bing Crosby White Christmas medley. Pagan Dorgan, the children’s ballet master, would have had her hands full coordinating the children in this and subsequent scenes, while Shanwen Tan, as the young Fritz Stahlbaum, was a natural performer, having a tremendous amount of fun and energy on stage. Over 300 young dancers were given the opportunity to perform on stage. Special mention must be given to RNZB artistic director Patricia Barker’s colourful costume design, a credit one would have to hunt for in the programme. Katherine Minor’s performance as the daughter, Marie, who is gifted the nutcracker doll, was perfect: full of the youthful innocence her character required, we journeyed to the Land of the Sugar Plum Fairy through her eyes. Nicholas Schultz had the right showmanship to play Herr Drosselmeier, the toymaker. There arguably hasn’t been this much snow falling in any RNZB production we’ve attended over the years, as Marie and the Nutcracker Prince (Fabio Lo Giudice) venture into the Land of the Snow, the snowstorm getting heavier as the first act concluded. 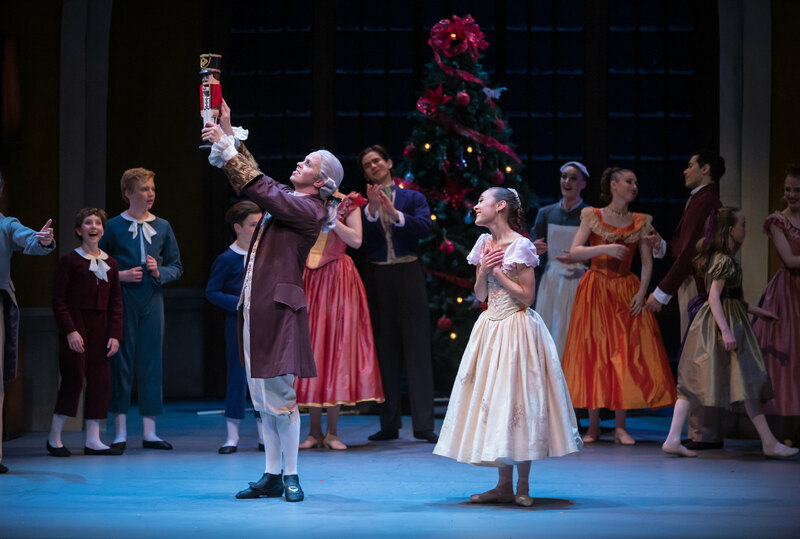 Their pas de deux here was particularly touching, as Marie realizes her much-loved nutcracker doll has come to life, with Caniparoli’s choreography bringing real emotion to the scene. The second act is where most of the dancers get a chance to shine. Abigail Boyle, in dual roles as Frau Stahlbaum and one half of the Arabian coffee couple, remains a stand-out performer. Nadia Yanowsky’s grand pas defied gravity and she mesmerized the audience as the Sugar Plum Fairy. When Yanowsky and Boyle danced, one in front of the other, near the end of Act II, you knew you were witnessing two of the company’s best in action. Loughlan Prior, pairing with Boyle, and Paul Mathews, with Yanowsky, were capable and flowing. There were plenty of dancers to keep an eye on, among them Kihiro Kusukami (as Chinese Tea), who showed great control; while Alexandre Ferreira shone as one of the Spanish Chocolate quartet. In a concession to New Zealand, there were characters of Dewdrop (a fantastic Sara Garbowski) and pōhutukawa flowers joining the other countries at Marzipan Castle, replacing Denmark in the original Marius Petipa libretto. Three students from the New Zealand School of Dance and one intern from the Mt Eden Dance Academy also appear in the production.